Source: CICH graphic created using data adapted from Statistics Canada, Vital Statistics; Public Healthy Agency of Canada: Perinatal Health Indicators for Canada, 2013. http://publications.gc.ca/collections/collection_2014/aspc-phac/HP7-1-2013-eng.pdf -August 31, 2017. 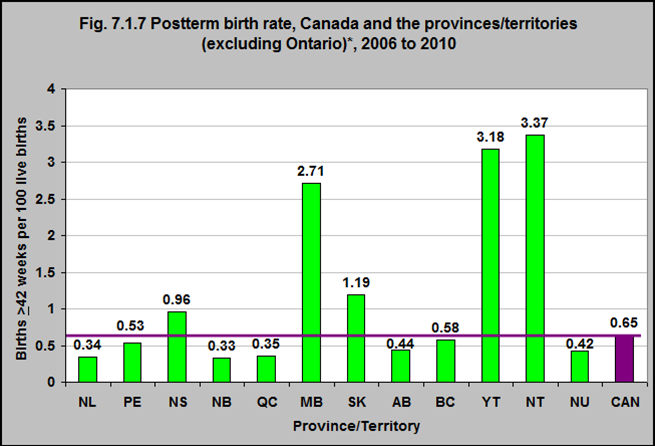 From 2006 to 2010, the postterm birth rate varied between provinces and territories. The lowest rates were in New Brunswick (0.33) Newfoundland & Labrador (0.34) and Québec (0.35). The highest rates were in the Northwest Territories (3.37) and the Yukon (3.18). 1Galal M, Symonds I, Murray H, Petraglia F, Smith R. Postterm pregnancy. Facts, Views & Vision in ObGyn. 2012;4(3):175-187.